Figure 14: Development acid stratification in lead-acid batteries with liquid electrolyte. Nowadays electrical energy plays an important role in our daily life which can be easily converted into light, heat or mechanical energy. A general problem, however, is that this energy can hardly be stored. Capacitors allow its direct storage, but the quantities are small, compared to the demand of most applications. In general, the storage of electrical energy requires its conversion into another form of energy. In batteries the energy of chemical compounds acts as storage medium, and during discharge, a chemical process occurs that converted into electrical energy which can be drawn from the battery. This process can be reserve in the batteries by doing the recharge process i.e. the intake of electric energy can restore the chemical composition that contains higher energy and can closely reestablish the original structures within the battery. - Primary batteries that are designed to convert their chemical energy into electrical energy only once. - Secondary batteries that are reversible energy converters and designed for repeated discharges and charges. They are genuine electrochemical storage systems. There is no clear border between them, and some primary battery systems permit charging under certain conditions. Usually, however, rechargeability is limited. The demand for improved or advanced rechargeable batteries for different application purpose is getting higher and higher. The new and evolving applications include electric and electric hybrid vehicles, electric utility energy storage, portable electronics, and storage of electric energy produced by renewable energy resources such as solar or wind generators. In addition, the performance, life and cost requirements for the batteries used in many of these new and existing applications are increasing more strongly. The lead acid battery is one of the most important and popular rechargeable electrochemical storage systems. For micro Hybrid Electric Vehicle (HEV) applications lead acid batteries are generally used, because micro HEVs requires low power and energy demand. Not only the price of this battery is cheap compared to other batteries but also it has a fairly high cell voltage of 2V. In this battery both electrodes contain only lead and lead compounds as active material and these electrodes are dipped into an aqueous solution of an electrolyte. The state of charge (SoC) of these electric vehicles is a very important fact to determine. But the state of charge of the lead acid battery is very dynamic, it changes widely with different operating conditions (voltages, current and temperatures), . 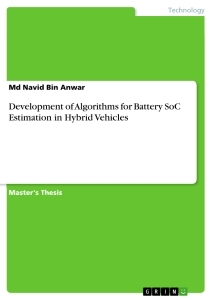 To determine the SoC of the battery different methods are discussed and a new algorithm is developed in this thesis work. At the end of the twentieth century, consumption of petroleum fuels increased significantly on a worldwide basis and the first symptoms of a petrol crisis appeared. So automobile manufacturers decided to reduce petrol consumption by combining an electrical engine with an internal combustion engine to run the vehicle. Thus, the HEV was developed which is different from traditional combustion engine. The beauty of the HEV is that energy can be fed back into the battery for storage, e.g., during regenerative braking (which is otherwise wasted as heat in a conventional vehicle). Hybrid vehicles are expected to require less fuel per mile of travel than conventional combustion engine vehicles. This not only results in lower local petroleum consumption, but also in lower emissions of undesirable pollutants. The major advantages of the use of HEVs are reduced dependence on fossil fuels and environmental benefits. For micro HEVs, the main purpose of the battery is to accept and utilize the energy from regenerative braking and support start-stop technology. In srat-stop technology, battery starts the vehicle and whenever the vehicle comes to a stop at red lights or in a traffic jam, for example, the system switches off the engine, reducing fuel consumption. The battery is commonly exposed to very high current pulses during both charge and discharge. In the hybrid vehicle, it is necessary to monitor the capacity of the energy storage system. So that the user can understand how far they can go with this energy storage. The state of charge is a challenge to determine for hybrid vehicle. Because the battery is a dynamic system and its capacity changes depending on many factors (temperature, less charging time, discharge rate etc) . In this thesis lead acid batteries have been investigated for this energy storage purpose. For HEV batteries, a widely fluctuating current profile; partial recharging phases (regenerative braking); inadequate lifetimes to date; expanding market and strong competition from other battery technologies is a major drawback in this application. Though as lead acid batteries are improved as well, they are widely used for micro hybrid vehicles, and the types of lead acid batteries, which are used in micro hybrid cars are quite similar to starter batteries. The battery supplies the car’s electrical devices such as air conditioning, the radio and the satellite navigation system on its own. The engine only runs when it’s absolutely necessary. Battery needs to be in a sufficient state of charge to enable “engine off”. The battery Management System (BMS) is used to diagonolysis the battery everytime, it keeps track of the battery’s SoC and sends the determined value to the energy management system, which controls charging and discharging of the battery and signal the value to the user of the portable device. So the motivation of this thesis work is to eliminate the drawback and determine the SoC of the energy storage system (lead acid battery) in the HEV. Because the conventional SoC determination method (e.g. coulomb counting, chemical method, voltage method etc) cannot measure the SoC correctly, which are explained in chapter 3. In this thesis, SoC is determination by using electromotive force. The electromotive force (EMF) is determined by the potential difference between the two electrodes of the battery. In this thesis, basic working principles and fundamentals of lead acid battery are discussed. Then different algorithms for SoC determination are investigated. The algorithms were implemented by using the lab measurement data and the result have been investigated. Afterwards a new algorithm has been developed to determine the SoC using the EMF. The new algorithm was also investigated by using the same lab measurement data. The results are then compared with other algorithms. The performance of the algorithm is also evaluated by calculating the error rate. Finally the algorithm is validated with the real time driving profile data and investigated the results and error rate for detecting the SoC of the battery. The galvanic cell is an electrochemical energy storage system. The electrochemical energy storage is based on the conversion of chemical energy into electrical energy. The fundamental working principle of the galvanic cell is explained in fig. 1. In the lead acid battery, there are two electrodes present (positive, negative). Each electrode of a battery contains a current collector, it has a very low resistance which ensures the current flow from the pole to battery cells. It does not contribute to the capacity of the battery but gives the mechanical support to the active materials. The active material is proportional to the capacity of the battery. There should be two electrodes in the battery, one is positive and another is negative polarized. The materials of the active mass of the two electrodes should be different, otherwise there will be no potential difference between the electrodes and no current flow will occur. Between the two electrodes is a separator. This makes sure that the two active masses will not become short circuited. Because if there is no separator the current will not flow through circuit connected to the battery but it will start to flow between the two electrodes inside the battery. So there will be short circuited inside the battery and electrical energy cannot be used anymore. All these elements are placed in a battery housing, which is filled with electrolyte. It can be water based or sulfuric acid based electrolyte. The electrolyte works as a medium for ions to move between the electrodes. The electrolyte has an important role in the battery. Often it is only the medium for electrode reactions and ionic conductivity, but for lead acid battery it also take part in the cell reaction. When the two terminals of the battery are connected through a charger or a load the current flows from positive to negative electrode or vice versa and electrons flow alongside of the current collector. From the current collector itgoes into the active materials (as shown in Fig 1). Then electrochemical reactions take place on the surface of the active material to the electrolyte. Due to the electrochemical reaction, ions flow between the electrodes. The separator should be a perfect isolator for electrons and on the other hand it should also have big enough pores through which the ions can diffuse from one side to other. Otherwise there will be a very high internal resistance which mostly depends on the electrolyte itself . According to the thermodynamics law, the equilibrium state is the state when all the reactions are balanced. In the electrochemical cell the equilibrium state can only be determined when there is no measureable current on the poles of the battery . In the equilibrium state, the thermodynamic parameters do not depend on the reaction paths; they depend on the different energy levels between the products and the reactants of the electrochemical reaction. - Enthalpy of reaction ∆H, represents the amount of energy released or absorbed, due to the electrochemical reaction. - Entropy of reaction ∆S, represents reversible energy loss or gain connected to electrochemical process. - Free enthalpy of reaction or Gibbs free energy ∆G, is the maximum amount of chemical energy can be converted into electrical or mechanical energy and vice versa. It equals the product of current times voltage. Where T is the temperature in Kelvin. In the equ. (2),[Abbildung in dieser Leseprobe nicht enthalten] (V) is the equilibrium voltage, It is the cell voltage when all the reactions are balanced. But this equilibrium voltage cannot be exactly measured even at the open circuit condition, since secondary reactions cause slight deviation. The open circuit voltage (OCV) is a mixed potential characterized by two electrochemical reactions that occur simultaneously at one electrode. For example the discharge reaction of the lead electrode and hydrogen evolution on the negative electrode of lead acid battery create a mixed potential, with the result of self-discharge . The open-circuit voltage for a battery system is a function of temperature and electrolyte concentration as expressed in the Nernst equation for the lead-acid cell  presented in equ. (3). Since the concentration of the electrolyte varies, the relative activities of H2SO4 and H2O in the Nernst equation change. A graph of the open-circuit voltage versus electrolyte concentration at 25 C is given in Figure 3. The plot is fairly linear above 1.10 specific gravity, but shows strong deviations at lower concentrations. Where is the temperature coefficient. Temperature coefficient and equilibrium voltage are normally measured at the standard temperature of 25 C. The relation of equilibrium cell voltage at any temperature is presented in equ.(5). By using this relation it is possible to get OCV for the battery system at different temperatures. Fig. 3, shows the relation between current-voltage of an electrode. In the Y axis it is the current flow in one electrode and in the X axis is the deviation voltage from the equilibrium voltage. U0 is the equilibrium voltage. At equilibrium the charge and discharge reactions on the electrode are both presented, but the resulting current flows of the opposite reactions are equal. So there is no measureable current at the battery. If the voltage is higher or lower than equilibrium voltage, a flow of the current occurs. The exponential relation between voltage and current is based on the fact that the charge/discharge reaction, in which the electrons are released or absorbed (the so-called transfer reaction) can be approximately described by an exponential law, called the Butler–Volmer equation which comes from Arrhenius equation is presented in equ.(6). where is the current density. The current density for the forward and reverse reactions at the open-circuit potential is called the exchange current density , which describes the rate at which this equilibrium is adjusted. is the actual potential, the open-circuit electrode potential and α the transfer factor describing the efficiency of the overvoltage on forward and backward reactions. The difference is called reaction overvoltage. The difference expresses the additional energy voltage required to force the current into one direction. Figure 4: Characteristic curve for charging and discharging process for one single electrode based on the Butler–Volmer equation (example taken from the lead electrode of a lead–acid battery). In the anodic reaction curve in Figure 4 it can be seen that, when the voltage is below the open circuit voltage then the current goes towards to zero. On the other hand if the voltage is above the open circuit voltage the flow of anodic current increases. is the voltage drop over the ohmic resistance inside the battery. Each part of the battery, the separator, the current collectors, the electrolyte, has a certain ohmic resistance. In Fig. 5 it can be seen that during discharge there is an ohmic voltage drop. When the voltage reaches the end-of-discharge voltage and the discharge process is terminated the voltage recovers after a while to the OCV. Abbildung in dieser Leseprobe nicht enthalten. Ureaction is the voltage which forces the reactions inside the battery in one direction, as described with the Bulter-Volmer equ.(6). is the diffusion overvoltage. The diffusion overvoltage describes the mass-transfer processes in the battery systems where the transport of species to and from reaction sites is required for maintenance of current flow. Where = initial concentration of the reacting substance (mole/L); = concentration at the electrode surface; d: thickness of the diffusion layer, . = current equivalent, = diffusion coefficient. In the Lead Acid battery, Pb and PdO2 are used as material for the negative and positive electrode. The electrolyte is dissolved H2SO4. The reaction on these two electrodes is as follows, which is also illustrated in Fig. 5. At the negative electrode, Pb is divalent into lead ions (Pb2+) and it reacts with the sulfuric acid and form lead sulfate (PbSO4). There are two electrons released. Here reduction of (Pb4+) to the divalent ion (Pb2+) leads to conversion of lead dioxide (PbO2) into lead sulfate (PbSO4). Here the two electrons are absorbed. So it can be seen that at both electrodes the product of the discharge reaction is PbSO4. It can be seen that there are no electrons in the reaction, because all electrons are counter balanced. The product of the overall reaction is PbSO4 and water. So it means during the discharge process it is not only consuming sulfuric acid but also generating water as well in the electrolyte. So the acid concentration is diluting (fig. 7). However, this layer is not quite stable and corrosion continues, which destroys the positive grid, increases the resistance of the grid and the mechanical stability. The Peukert law, is often used to estimate the capacity of cells that have a large dependence on discharge rate. Where is the constant discharge current and t is the discharge time. The constant n is an empirical number. For lead acid battery the value of n is between 1.15-1.11 . When the discharge current increases, a higher value of n highlights the relation between capacity and discharge time. The capacity of a battery depends on the temperature too. The rates of the reactions taking place in a cell, and the electrical resistance of the active and passive materials are temperature dependent. The capacity increases with increasing temperature from the nominal temperature and the capacity decreases with the temperature below nominal temperature (25 ). An example of capacity versus discharge current and temperature is shown in Fig. 7. SoC describes the charging rate of the active materials or SoC is the percentage of the maximum possible charge that is present inside the rechargeable battery. The SoC is 100% at the fully charge state. At OCV it is considered that the battery is relaxing and there is no more current flow. It is found that there is almost linear relation between SoC and OCV for lead acid batteries . So after determining the equilibrium state of the battery, the open circuit voltage of the battery can be taken as almost equilibrium voltage (chapter 2). By using this OCV, the SoC can be found (as presented in fig. 8). Normally a lead acid battery voltage needs around 8-48 hours to be completely relaxed . If the battery switches from discharging state to resting state, it takes 8hrs until the voltage has reached the equilibrium value. If the battery switches from charging state to resting state and has been charged for more than 1 hour beforehand, the voltage needs more than 48 hours to be fully stable . If the battery is charged for a few minutes (or half an hour) the battery voltage stabilization needs less than 48 hours . During the discharge process, two electrons are withdrawn from the metallic lead and dissolution of Pb2+ ions into the electrolyte occurs. Through diffusion, these Pb2+ ions are transported to the reaction site (chapter 2: Overvoltage due to concentration gradients). There, the Pb2+ and the ions meet and form PbSO4 by a chemical precipitation process. The electrochemical reaction, the transfer step, can only take place where electrons can be supplied or removed, which means that this conversion is not possible on the surface of the lead sulfate, as lead sulfate does not conduct electric current. For this reason, the Pb2+ ions must be dissolved and transported by migration or diffusion to the conductive electrode surface (lead or lead dioxide). During charging, the reverse process takes place. Pb2+ ions are taken from the electrolyte to form solid Pb. These ions are transported by diffusion processes to the reaction site. To stabilize the Pb2+ ion concentration in the electrolyte, a chemical dissolution process of the PbSO4 crystals takes place. Because the positive ions are removed from the crystal through the electrochemical process, the ions need to be transported away from the reaction site to assure electrical neutrality. All these processes cause concentration overvoltage. Besides these concentration overvoltages there is also an ohmic voltage drops caused by the electronic as well as the ionic currents in the conducting parts including the electrolyte and reaction over voltage. At the very low current this polarization and the ohmic drop are small, so the cell may operate close to the open-circuit voltage and the cell can deliver most of the theoretically available energy. But when the operating current is higher, these losses are increased too, so the theoretically available energy hardly can be achieved, as shown in figure 9. The state of charge of a battery can be explained by a scale of available capacity. The available capacity is dependent on temperature, current rate or nominal capacity of the battery. SoCCN is the nominal capacity with nominal current and at nominal temperature. In SoCCN, from 0% to 100% is the nominal capacity of the battery. But batteries sometimes can be discharged even more as it is written on the rated value on the battery, which means the actual capacity is higher than printed on battery. It is done by increasing the active materials. SoCCN is the SoC related to the nominal capacity with nominal current and at nominal temperature (25 ). SOCCENAV is the SoC related to the available capacity at nominal temperature after physically full charging. It explains the ageing effect of the battery. In the new battery, 0% SoC -can be reached. But due to aging the 0% SoC will go up, due to the reduction of the capacity of the battery. This deviation of capacity (∆Cirrev) cannot be regained, it is irreversible. SOCCENDIS is the SoC related to the available capacity at actual temperature after physically full charging .It shows the effect of temperature of the capacity– as shown in fig. 9. Here 0% SoC also move upward and the total capacity becomes smaller, if the actual temperature is lower than the nominal temperature. SoCCAV is the SoC related to the capacity after an operating charging at nominal temperature. In operating charging CCCV (constant current- constant voltage) is used. In CCCV, constant current charging is done until a voltage limit is reached (16V or 14.7V) and afterwards a constant voltage charging is done at this voltage until (16V or 14.7V) untill the end-of-charge criterion . Lead Acid battery, as a starter battery of the car at, normal operation can be charged up to maximum 90% of SoC. Because of cell polarization and losses become higher with increasing current and also short time of driving , the regeneration of acid in the electrolyte is not possible. Cause all the PbSO4 crystal cannot break into ions in the short period of time . As a result the acid regeneration is not fully possible and therefore the maximum capacity reaches up to 90% of SoC. SoCCAVDIS is the available capacity after an operating charging at actual temperature. Flooded batteries have a liquid electrolyte. The battery is not sealed for allowing the gases (hydrogen, oxygen) to emerge from the battery. However, this results in a decrease in the water content of the battery and therefore the electrolyte level decreases and the concentration of the sulphuric acid increases. The water loss needs to be compensated during the maintenance. Deionized water must be used for refilling and not sulphuric acid or tap water. For the valve-regulated battery it works another way. There the electrolyte is filled in an absorbed glass matt (AGM) or is presented in the form of gel. In these gel or absorbed glass matt so-called micropores form and oxygen can diffuse through this micropores from the positive to the negative electrode. Diffusion though air is faster than through water. So at the negative electrode the oxygen reacts to water. This also happens in the flooded battery, but in valve regulated batteries the rate of this oxygen cycle is higher, because in the flooded battery the gases (H2 and O2) escape from the cell rather than recombinate. So the advantage of VRLA battery is, that it does not need to be refilled with water and there is no released Hydrogen which could not be converted into water again. Sulfation is the process of growth of large sulfate crystals. Due to the discharge of the battery there is a development or growth of already existing sulfate crystals inside the electrolyte. It is good to have more small sulfate crystal with a big surface area, so that they can be dissolved during charging easily. If a battery is kept idle for long time in a not fully charged condition there will be growth of sulfate crystals and the surface area is reducing. The solubility increases at low sulphuric acid concentrations or at high temperatures. Due to charging and discharging of a battery or due to the production or usages of acid an effect occurs, called acid stratification. During charging sulfuric acid is produced and increases the concentration of the electrolyte. During this process, the acid density in the bottom part of the battery will increase, because of the higher weight and gravity of the acid in the electrode pores, which fall down to the bottom part of the battery. As a result the acid density at the lower part of the battery will be higher than in the upper part of the battery. So for this consequence of acid stratification the upper part of the electrode the active material is only partially utilize due to lack of acid. On the other hand the bottom parts are overstressed in both electrodes. The positive grid of the lead acid battery is corroding all the time, because it is not thermodynamically stable at the potential of the positive electrode. It depends on the acid density, electrode potential, temperature and grid allow. Due to this corrosion the internal resistance will be increased and the mechanical stability of the grid will be reduced. This effect is an irreversible process. The water loss is another aging effect of lead acid batteries. It is most common effect in flooded battery. It is a reversible effect, because the water can be refilled, because besides the main reaction there is side reaction, where this water is splitted into H2 and O2. This happens already at lower voltages and the rate increases with increasing voltage. So as the water loss happens, the level of electrolyte will be decreased and the electrode may be open and come into the contact of the air. This causes the lead of the negative electrode to lead oxide and this lead oxide is an isolated material. So there will be reduced electron flow and because of the corrosion the electrode can break. This gassing process effect, accelerates by the factor of two with temperature increase of every 10°C. To design a method of SoC indication is difficult because of the unpredictable behavior of the battery. The SOC determination is difficult because it depends on many factors such as temperature, battery capacity and internal resistance as already described in chapter 2. The conventional methods for SoC determination cannot determine the SoC correctly because of many drawbacks described below in this section. To determine the SoC in this dynamic situation there are methods which are already used. This method can be used for SoC indication if the electrolyte is liquid. The specific gravity or pH level of the electrolyte is measured with a sensor inside of the electrolyte. As the acid density is directly proportional to the capacity of the battery (as explained in chapter 2), this method can be one of the most simple methods to determine the SoC for Lead Acid batteries. Problems with this technique are the occurrence of acid stratification, water loss and long term stability of the sensors and you have to open the battery. The first two (acid stratification, water loss) can be avoided by electrolyte circulation and automatic water refill systems. Additionally, the measurement of the physical properties of acid cannot be done in the pores of the electrodes where the acid is actually either consumed or produced. This means that during high current processes, slow electrolyte diffusion is a source of error for this technique. The drawback for this method is that it is very sensitive to the temperature and impurities, and there is also a problem with the stability of the sensor in the electrolyte. So it cannot be used for starter batteries. Voltage method is a kind of book keeping method. Here the voltage reading is converted to corresponding SoC by using the previously known discharge curve (voltage vs SoC) of the battery (fig. 15). The further explanation is given in the later chapter. But the voltage of the battery is largely affected by the current flow and temperature. So determination of SoC depending on only voltage is not accurate enough . Because the cell voltage is influenced by internal resistance (depends on the temperature) and also the small current discharge of the battery. This causes the cell voltage drop of the battery even in the relaxation period . Where is the initial capacity, is nominal capacity, is battery current, is the current consumed by the loss reaction. The problems of this method are, during charging and discharging there is a voltage drop on the load carrying cable, and the precision of the current measurement, which is due to sensor error. Other problems include the establishment of the initial value of SoC, which is a boundary condition. And the main problem for Coulomb counting is that it requires an initial value and needs to be calibrated regularly to ensure an accurate SoC determination . To determine the SoC a new method is developed which is different from the others classical SoC indication methods. The term EMF stands for ElectroMotive Force. It is the battery’s internal driving force for providing the energy to a load. The EMF can be determined by using the method called voltage relaxation  . In this method the voltage is measured during the battery relaxation, after the current interruption which is equal to the open circuit voltage. But it takes long time (8hrs) to be relaxed . The linear relation between EMF and the SOC is used in this method . where EMF is the final relaxation voltage, is the value of the current OCV measured, dv/dt is the rate of change of the OCV, T is the battery case temperature and a, b, c and d are parameters with numerical values. The rate of change of OCV (dv/dt) is calculated from voltage difference between the first starting voltage and the end voltage of the relaxation period over time. In this method, at least one charging or discharging voltage is recorded to reach different levels of SoC. Then measuring the battery open circuit voltage (OCV) at each of the different levels of SoC at a time after the charging or discharging has stopped and the battery has reached an equilibrium settled state. The result shows in , that this algorithm has high degree accuracy, defined by confidence factors of R2=0.99, during the plotting of SoC vs OCV. The method described in , is a voltage-prediction method during the voltage-relaxation. The end value is determined on the basis of the measured of a voltage-relaxation curve and mathematical optimisation/fitting of a function to this measured part of the relaxation curve. In addition to the unknown voltage-relaxation end value, the function contains three parameters (a, b and c) that are also found by fitting. This algorithm describes only the relaxation of the voltage. It does not described the ohmic voltage drop due to internal resistance and decreasing voltage due to small current discharge of the battery. The correction can be done by adding the discharging part of the equation (m*t) and by adding the internal resistance part (Ri*I) with the estimated EMF value. The more explanation for these (m*t) and (Ri*t) are given in the next chapter. As the relaxation process is consequently a complex function involving several factors, such as the SoC, amount of charge added or removed from the battery, temperature and aging. This large number of dependencies makes it difficult to predict the EMF at the starting of the relaxation period. where parameters a > 0, b > 0, c > 0 are the rate-determining constants, d is equal to +1 if the voltage is increasing (relaxation after a discharge step) and equal to –1 if the voltage is decreasing (relaxation after a charge step), EMF is the final relaxation voltage, OCV(t) is the open circuit voltage at time t, logc(t) is the natural logarithm (with base e) of time [s] to the power of parameter c.
In this model, the double exponential part describes the voltage relaxation part of the battery voltage, because one exponential function is not enough to describe the relaxation behavior of the battery for the long period of time (6hr) (Fig. 17, 18) and the small current discharge inside the battery is described as integration of the current and can be modeled by a linear part with the slope m (m*t). , are parameter and , are time constants of the exponential parts. This equation should maintain the lookup table for these parameter values for different SoC, temperature and discharge current to calculate the EMF values. Here, is battery voltage at any time t, is the current integration overtime. During real driving scenario the current discharge may not be constant, it changes over time. is the end voltage of the relaxation period. So after adding the ohmic voltage drop ) because of the internal resistance, the actual EMF is calculated (fig. 15). Because the EMF value also decrease over time due to the small discharge current. Where Ri is the internal resistance of the battery and I is the discharge current. To analyze the methods described before, lab measurement data was used. The algorithms, which are described in (3.4.1, 3.4.2, 3.4.3) are validated by using these measurement data. The measurement data has been collected for different SoC, current and temperature. After the validation the results are compared among them. And finally the best algorithm is identified depending on these results. was done according to the following steps, first the battery was charged and then there was a 6hrs pause so that the battery could come into a almost relaxed condition. Then the battery was discharged with 20mA for 6hrs and then there was a pause for 1hr (as shown in figure 20). After 1hr pause, the battery was charged with 20mA for 6hrs again and then there was also a 1hr pause (Fig. 21). Afterward the battery was discharged with 50mA and 100mA at the same way. So at every SoC level which are 90%, 70%, 50%, 30% there was a step of discharge and charging stage at different current rate (20mA, 50mA, 100mA). The battery was discharged from 90% SoC to 70%, then 70% to 50% and finally ends at 30%. After that it was again recharged to 30% to 90% in the same way (Fig. 22). The EMF at every SoC is measured also from the measurement. It is measured by finding the end value (voltage) during the relaxation period of every SoC level before it starts discharging (fig. 18). It is calculated during the discharging period of the battery. So there is no overpotential present. The EMF value at different SoC is listed in Table 1, which is directly collected from the lab result. The relation between SoC and EMF can be demonstrate in Fig.24.